Isidor Glück was a Hungarian surgeon who emigrated to London and then the United States in the early 1850s. 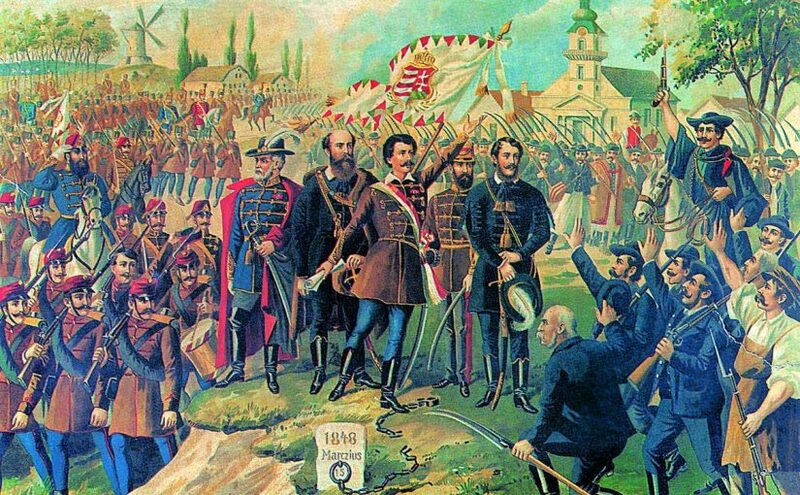 As a supporter of the failed revolution led by his compatriot Lajos Kossuth in 1848 he had little option but to leave his homeland, and spent the rest of his life in exile. In 1855 he was invited to give a series of public lectures in New York about military surgery, for which he drew heavily on his own experiences serving in Kossuth’s army. Glück evinced particular admiration for the Honvéds (soldiers) of the Hungarian 9th battalion, known as the red caps, and their ‘extraordinary heroism’. The ‘red caps’ can be seen in the image at the top of this page, which shows the Hungarian poet and revolutionary Sándor Petőfi declaiming his poem Nemzeti dal (“National song”) in Vörösmarty Square in Budapest, an event widely believed to have inspired the Revolution. D. P., a good-looking red cap soldier, twenty-four years of age, received a wound in his left thigh, from a bullet discharged from the rifle of a barbarous Serb, who stood on the top of a low church tower, and subsequently fell motionless to the feet of the wounded Honvéd. The red cap Honvéd, exasperated at the destruction of the enamelled cross he carried in the pocket of his pantaloons, as a sacred reminiscence of his mother, fought like a lion, after having received the shot, alternately bayoneting, loading, and discharging. For his wound he cared little. The battle that began at two o’clock, and at about four cost him a wound, found him at nine in the morning yet among the last on the field. Not only were these Honvéds fierce warriors, they cared deeply about their mothers. When the battle was at an end, he repaired to the ambulance with his swollen limb. The bullet could not be found, in spite of several attempts. The wound, however, healed up; after nine weeks, he wore his red cap again in rank, and was promoted to the rank of officer. He paid little attention to his leg, and it gave him no trouble while the war was raging. In his fortunate escape to England, the wound broke open, and passing some time in the hospitals of the various countries he travelled, the bullet was several times looked for, but not found—he left the hospitals with the bullet in his thigh. When Dr Glück refers to the bullet being ‘looked for’, he means that a surgeon had a good rummage around in his thigh with a probe. Not much fun. While a refugee in London, he suffered, off and on, until tired, when be resolved to have it cut out. One day, much annoyed by the pain in his thigh, he called at my office, and not finding me in town, he applied to one of the surgeons of the day, who, after examination, could not ascertain the situation of the ball. I repaired with my countryman to the hospital, where, in the presence of the pupils, I explained that my comrade, aged twenty-four, had been in forty-nine engagements, and in one of these battles received a gunshot wound in his left thigh. A laugh of admiration by the pupils startled my comrade, who at that time ignorant of the English language, feared to appear ridiculous, and on no account would submit to any further trial. Highly strung as well as hard as nails, evidently. Walking home, the pain in his thigh increased, and he decided on having the ball out at once. He lit his cigar, ordered a pail of water, undressed, and laid down in bed. Next time I cut my own thigh open I definitely intend to smoke a large cigar while doing so. A penknife, used for cleansing his pipe, he seized, for want of any other instrument, stuck it along the cruralis muscle, two inches from the knee-joint, and feeling with his finger, thrust it to the very bone, wherefrom he drew it upwards, forming, most deliberately, a wound two inches in length, which admitted his finger to search for the ball, which he luckily extracted, after some considerable searching. Bandaging his thigh, he applied cold lotions, and was well in a fortnight. Thus the red-cap soldier operated upon himself. “After some considerable searching.” A bland sentence concealing a whole world of self-inflicted pain. I doff my cap to him. I recently cut open and removed a small foreign object from a dermal abscess on my abdomen. It was moderately painful and if I had to do it again, I would probably want a local anesthetic, but even though it was in the skin and was about ready to rupture anyway, it was incredibly difficult to deliberately cut into myself. I can’t imagine being able force myself to cut into my own muscle, let alone stick my finger in and rummage around.